Interesting name for a cafe I would say. Finally decided to pay this cafe a visit because my companion recommended this and I wanted to try it. It was a Saturday and around lunch time when we arrived. Hence, no surprise to see such a crowd in the cafe. We were considering whether to wait or take the outdoor seats when the head barista came out and offered us to share seats with two other dudes on a four pax table. We accepted it because the weather was too warm for us to take it. Inside the cafe was really cozy, but seats were really limited and the walking space too. We had to squeeze ourselves in between seats to get to the table. Where the head barista is at work. I noticed they served ice cream too! Was too full after what we had, so we gave this a miss. Love the simple layout which was easy to read. Partner ordered Mocha Milkshake ($5.90) which was rather addictive under the sunny weather. The thickness of mocha was adequate and I would recommend this if you love mocha. There are other choices to choose from as well, like Chocolate, Strawberry, Vanilla, Banana and Oreo! As for me, I instantly made my choice when I saw Bailey's Coffee ($8). What else is there to ask for, other than a perfect cup of caffeine and alcohol. I would definitely go back for this if I happen to be around the area. The Ultimate Combo ($11.50) which consists of 2 fluffy pancakes, pork bacon, chicken chipolata and two sunny side ups. From the looks of it, I feel full in the tummy already. Haha! Happy partner with her food! Was craving for rosti, and there, they have it! You can also choose the ones with Smoked Bratwurst ($16.90). The rosti was good but I guess I had better ones over at Marche for the time being. And it was alittle oily but the sour cream saved the day! It was an awesome brunch experience tho! Will make return visits for other coffees and truffle fries as well as the cereal bacon rolls!!! Headed over to Haji Lane for a short walk thereafter. Free Parking on Sundays & PH! Just a humble foodie lover who wants to share her foodie journey with the folks around. Nothing fancy, nothing special, just another blog that writes about food and food andddd FOOOOOOD! D' Laksa : Authentic Penang Assam Laksa at just RM5!! Grin Affair : Keep Smiling With The Cakes In A Jar! 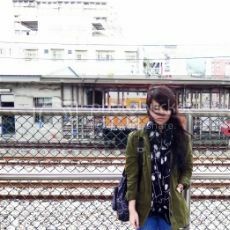 WOOLLOOMOOLOO Cafe : Cafehopping in Taipei! CHIR CHIR 치르치르 : Can't Get Enough Of These Korean "Chicks"! Hai Di Lao Hot Pot Review : Awesome Steamboat you gonna love!